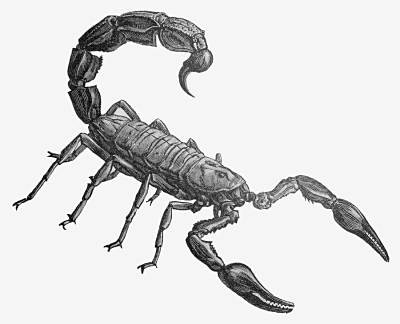 Can Occam’s razor slice through a Scorpion? Occam’s Razor: use the simplest means possible to accomplish your goal. If Ockham’s monastery pew became a time machine one day and he was transported to 2010, the philosopher might be curious about the many incredible scientific advances we’ve made in the past 800 years. The first assignment for my wine microbiology lab this semester is to identify the bacteria and/or yeast contaminating an unidentified wine sample. The professor will give each group two wines — one spiked with nasties — and ask us to give him a report on what we found in the wine and how we found it. 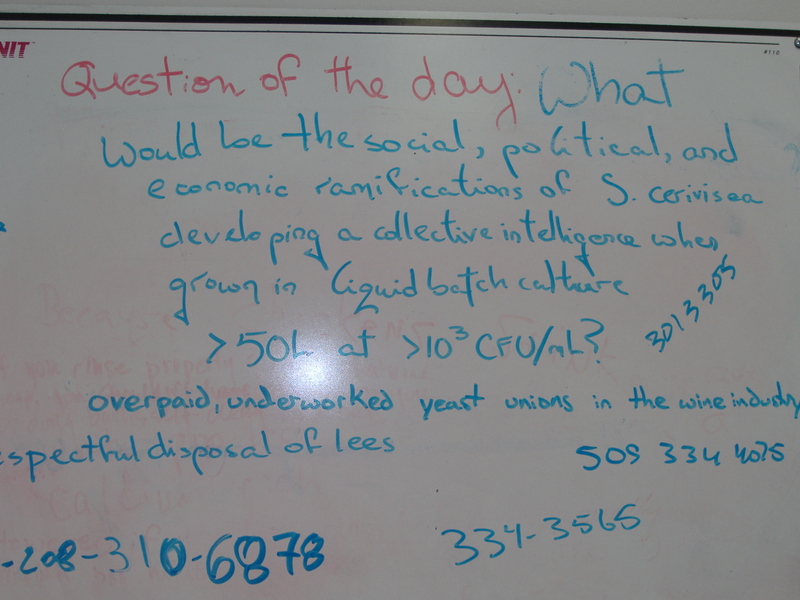 The first part of the assignment is to propose a method for attacking the problem: when we have the wine, how will we analyze it? Oooohhh…There are lots of ways to analyze wine, and I could show my prof that I know about them by including all sorts of nifty things in my report. Scorpion analysis is outside my budget, but I could always run my own genetic tests if I can find out where to buy the right genetic probes. Or I could smell it. “The nose knows” may be cheesy (why cheesy? Why not yogurty, or cucumbery? There’s a whole ‘nother kettle of fish…) but such aphorisms arise because they are true. Looking at my lab manual and the list of microorganisms that could be the unknown contaminant, each has a peculiar smell. Brettanomyces bruxellensis is probably the most famous — many wine lovers can identify “Brett” — but Pediococcus parvulus, Acetobacter, and Lactobacillus species have distinctive aromas, too, as I know from culturing them in the lab. Oenococcus oeni, a bacteria very often responsible for malolactic fermentation, is a little trickier to identify based on smell alone, so I might need to move up to the next level of complexity (by the way, we aren’t allowed to use taste as part of our analysis; some of my classmates are underage.) If my nose isn’t quite sure, I can drip a few milliliters of wine onto a Petri dish and see what grows. We make Petri dishes full of growth media for yeast and bacteria by combining sugar, some protein and a few other basic nutrients, and adding agar — a gelatin-like substance from seaweed — to make it solidify. Culture media in a dish is essentially Jello (mmmm….yeast extract-flavored Jello!) Any bacteria and yeast in my wine will grown and reproduce on this media and, after a few days in a nice warm incubator, each little microbe will have grown into a colony of identical offspring microbes that I can see with my naked eye. Different bacteria and different yeasts have different colony morphologies; they look different; even within the same species, different strains can have different morphologies. One of my favorite strains of Brettanomyces bruxellensis looks like this. Between smell and colony morphology, I expect excellent odds of correctly identifying the bugs my professor has hidden in my wine. My nose, and Jello in a Petri dish. In terms of levels of complexity, I think that I’m ranking far below genetic testing even if I do need to use the Jello. I could spend several hundred dollars to use the fancier technology, but why bother when the good, old-fashioned, simple method will do? Now, I’m not at all knocking ETS Labs; Scorpion is a potent analysis when you need to know “how much” as well as “what,” for complex microbial problems, and for busy wineries amongst other things. Scorpion analysis definitely has its place, but this isn’t it. What is the aerator-oxidator apparatus, and why am I spending so much time using it? The short explanation: I’m measuring wine sulfites. The long explanation: I’m using the aerator-oxidator method to measure free SO2. A good day measuring free SO2: no breakage! The molecular formula for the sulfite ion is SO32-, formed when sulfur dioxide, SO2, reacts with water to form the bisulfate ion, HSO3–, which can then dissociate to SO32- + H+. All of these forms are found in wine – wine is an aqueous solution – but SO2 is what winemakers actually add, usually in the form of potassium metabisulfite or K2S2O5. For as casually as we toss around the phrase “wine sulfites,” their behavior is remarkably complex. Potassium metabisulfite, sold by the kilo in winemaking supply catalogues, is a salt that releases potassium and molecular sulfur dioxide when dissolved in aqueous solution. We care about molecular SO2; this is the “species” of sulfur to which we can ascribe antimicrobial properties. Molecular SO2, however, quickly dissociates into ions which either remain “free” in the wine or become “bound” to other solutes like acetaldehyde, pigments, and sugars. SO what? Beyond plain old cleanliness and sanitation, SO2 is probably the most widespread antimicrobial agent used to protect wine, During yeast-driven alcoholic and bacterial-driven malolactic fermentation, (the right kind of) yeast and bacteria in your fresh grape must is a good thing. Thereafter, the presence of most yeast and bacteria in fermented wine means contamination, nasty flavors, or even unsafe wine. SO2 diffuses into yeast and bacterial cells and does all sorts of destructive things: damaging DNA, glomming up the structure of important enzymes, and reacting with nutrients so that the microorganism can’t use them for growth (like a game of chemical keep-away.) The end result isn’t always to kill the bug, but the durn thing isn’t likely to keep multiplying. Like humans and most other living things, yeast and bacteria don’t reproduce well when they’re starved and stressed. 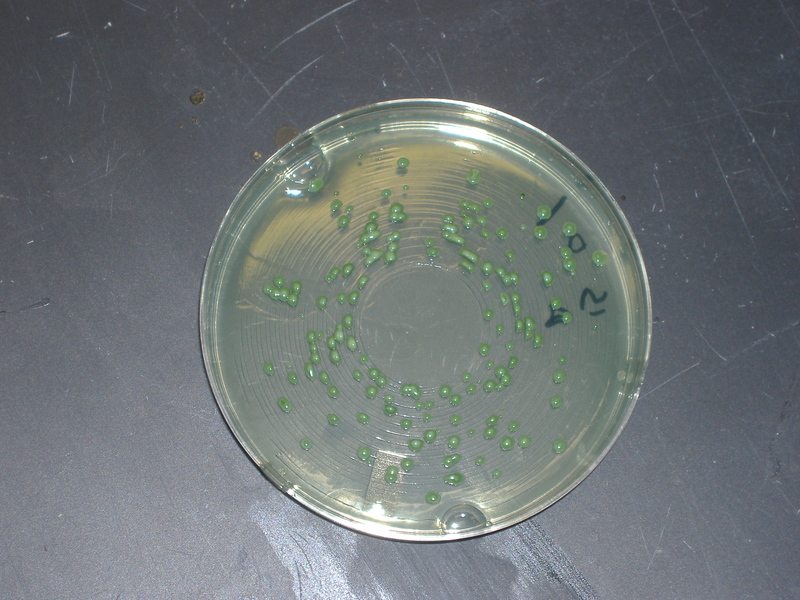 Microbial susceptibility to SO2 varies: 20mg/L will suppress some, while others withstand upwards of 40mg/L molecular SO2. SO back to the original question: what is this great big fragile glass apparatus, and what does it have to do with SO2? 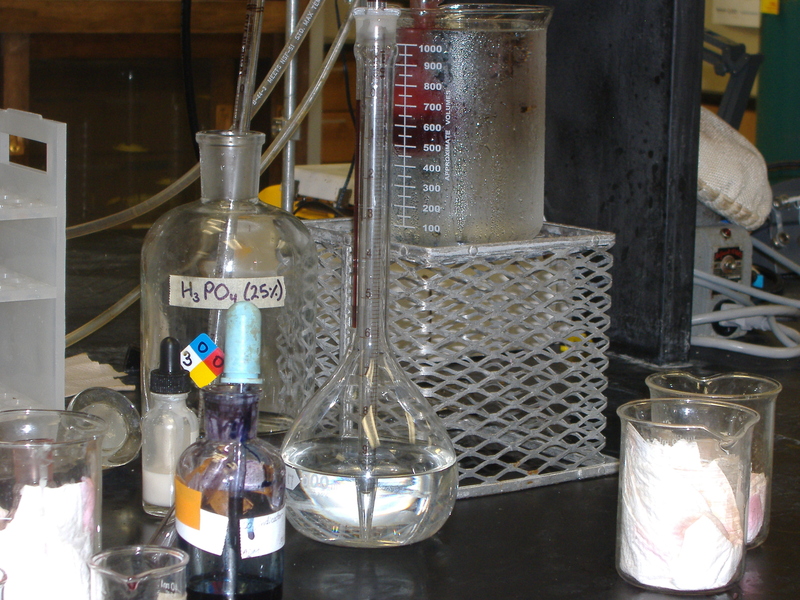 The only name for it seems to be “the aerator-oxidator apparatus” and – go figure – it is used to measure SO2 levels by the “aeration-oxidation” method. Air bubbles through a wine sample – “aeration” – carrying volatile “free” bisulfite up and through a condenser and into a vial of hydrogen peroxide, where it reacts with hydrogen peroxide and water to form sulfuric acid. In other letters, SO2 + H2O2 → H2SO4, an “oxidation” of SO2. Adding a color indicator that flips from royal blue to teal when pH flips from acidic to basic means that sodium hydroxide (a base) can be added to the hydrogen peroxide-plus-sulfuric acid solution to negate the acid. This is just a good old acid-base titration: when the amount of slowly-added sodium hydroxide exceeds the amount of sulfuric acid, pH and color both rapidly change. The final step is calculating sulfuric acid from sodium hydroxide and sulfur dioxide from SO2. Remember all of those different forms that sulfur dioxide takes in wine? The aerator-oxidator method can be adjusted to measure either free or total SO2. But wait! I thought that the antimicrobial form was molecular SO2, and you say that we’re not measuring that? Conveniently, molecular SO2 can easily be calculated from free SO2 and the pH of your wine. To measure free or molecular SO2, the wine sample is acidified and chilled for the duration of this whole bubbling business. Acidifying the wine – increasing the concentration of H+ — forces the equilibrium between SO2 +H2O ↔ HSO3= + H+ entirely to the SO2 side. All of those aforementioned types of SO2are volatile and can make the trip from the wine-containing flask up through the condenser and into the H2O2 –containing flask EXCEPT the bisulfate ion that is bound to other compounds in the wine. (Incidentally, chilling the wine sample ensures that heat energy doesn’t break any of those bonds apart.) On the other hand, boiling the wine sample provides enough energy to break (virtually) all of the non-covalent bonds, freeing the bound ion, and allowing the “total” amount of SO2 in the wine to volatilize. Measuring total SO2, then, is exactly the same procedure as measuring free/molecular SO2 save that the wine-containing flask is boiled rather than immersed in an ice bath. The best part of the whole process? It takes longer to explain and understand than to perform. Yes, I did take general chemistry for a reason! 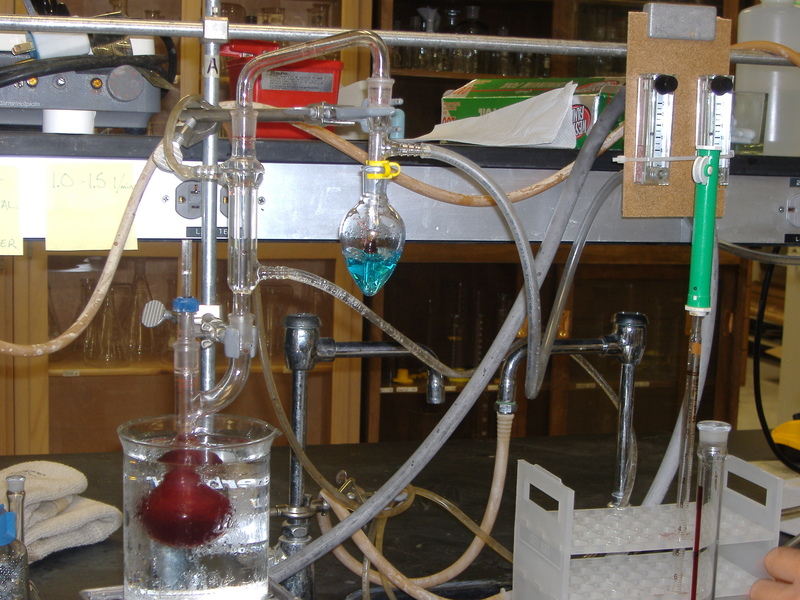 Cons: it takes an entire 10 minutes per sample, all of the SO2 may not bubble out of the wine, any gaps in the glass-to-glass connections allow SO2 to escape before reacting with the H2O2, and the whole contraption is disturbingly prone to breakage by tired/rushed/frustrated grad students. By the by, why do some people say that they are allergic to sulfites? A .01%-sized handful of the American population lacks the enzyme sulfite oxidase and literally cannot metabolize sulfites; these folk are also asthmatic and usually have trouble breathing and break out in a rash when they consume sulfites (from wine, dried fruit, lunch meat, ect.) In all great likelihood, you aren’t one of those people. 1. You spend most of Saturday at a food preserving and canning party and think that you’ve had a great weekend. 2. You have a book out of the library titled Good Morning, Kim Chi and you’re reading it in the bathroom. 3. You routinely take an empty nylon bag on walks so that you can collect wild herbs as you go. 4. You wonder how WADY — wine active dry yeast — will make your pizza dough taste. 5. Your friend brings you a can of wine as a present from his road trip. 6. When your friend presents you with the can of wine, a 45-minute conversation ensues about how the can must be lined to prevent aluminum flavors, processing temperatures, oxidative implications of a sealed container versus wine under natural cork, expiration date, ect. 7. Your next big volunteer project is co-teaching a class on non-alcoholic home fermenting. 8. Your counters, the top of your refrigerator, and one of your kitchen cabinets are all full of six different vegetable, dairy, and grain ferments. 9. You’ve been known to take home a petri dish or two to try culturing the organisms fermenting your home-made sauerkraut. 10. When no one is looking, you occasionally taste your experiments.